Thyrocare Technologies has been generating a lot of buzz since its listing. Many investors are interested to know if they can expect multibagger returns from the stock. While preventive healthcare industry is one of the fastest growing industries in India, there are a very few branded players with superior technology in this field. Multibagger returns ( 3 times, 5 times, 10 times, etc) are usually from sectors that have significant tailwinds behind them. We have identified many multibaggers in the past – Dewan Housing, PC Jeweller, Shakti Pumps, Mold-Tek, etc to name a few based on this framework. The company was started in 1996 by Dr A Velumani. The company has a centralized processing laboratory which is fully automated. The company relies on Air logistics to bring around 25,000 samples a day from across India to its CPL. The samples are processed at night and reports are uploaded on the website for customers to see. The company has a strong management – Something most multibaggers have in common. The healthcare sector has many strong tailwinds. This industry has the potential to deliver multibagger returns. The radiology business has seen revenues increase but was seeing negative to low EBIDTA levels. In FY17 the EBIDTA levels of this division stood at ~ 13%, we however expect lower EBIDTA levels from this segment of the business as regional presence is pushed. Point to be noted is that the radiology business is showing a positive EBIDTA due to profits from the trading of materials. The imaging business is still in the negative EBIDTA territory. Imaging – An asset heavy business. Imaging includes procedures such as X-rays, ultrasounds, etc. These tests require specialized machines which involve a high capital outlay initially. Thyrocare is aggressively pushing up revenues in this segment (From Rs 5.12 Crores in FY15 to Rs 18.29 Crores in FY17). The EBIDTA is still negative but the losses have come down from previous year levels. Thyroid tests make up roughly ~ 28% of the company’s tested samples while generating close to ~ 15% of its standalone revenues. This share is for FY15 and has been trending lower as seen from FY13 numbers. Interesting Note: When we had picked up PC Jeweller in the Rs 100 to 115 range (FV:10), the market feedback was that many local and unbranded players were keen to take up a franchisee with PCJ due to the shift of preference towards branded jewellery. The stock went on to give us strong multibagger returns. Going forward, we expect a similar change in trend in diagnostic industry. Companies like Thyrocare, Dr Lal Path Labs, etc enjoy roughly a 10% market share but their technology and reach is unparalleled. The pricing is lower than the local players, especially under the Aarogyam umbrella, the company is able to give many tests at low prices. The company is on a > 20% growth trajectory but is facing pressure on the margins front. Where is this pressure coming from? Cost of materials consumed has largely remained in a range for the last four years. As a % of net sales, the employee expenses have gone up significantly from ~ 6.8% in FY11 to close to ~ 9.8% in FY17. The rising employee costs are majorly due to new line of businesses being developed and the rapid expansion. The employee strength has increased from 329 in FY11 to 671 in FY17. This has taken a toll on the EBIDTA. – The company’s working capital has been reducing consistently, infact its creditor days are more than debtor days which signifies negative working capital requirements. – The company has Rs 11 crores of cash and current investments of Rs 101.48 Crores at cost. Dr Lal Path Labs is another listed company from the listed space. In the below table, we compare the standalone numbers of both the companies. 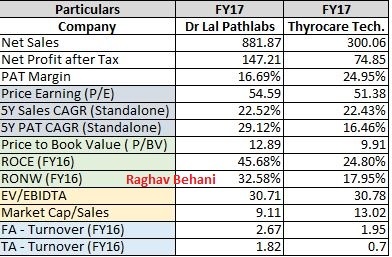 Can Thyrocare be a multibagger? With a consolidated PE of 55, there is little margin of safety for investors at current levels. However, high PE stocks not delivering multibagger returns is a myth (Example: Kotak Mahindra, IndusInd Bank, etc). So should an investor invest in Thyrocare and if yes, how much % of the portfolio should he allocate to this stock?